Macedonian composer of mostly orchestral, chamber and vocal works that have been performed in Europe and elsewhere. 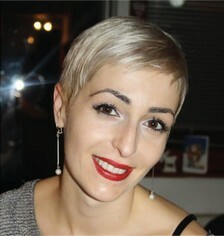 Ms. Andovska studied music theory and piano with various teachers at the Ilija Nikolovski-Luj School of Music in Skopje from 1993–97 and composition with Goce Kolarovski at Ss. Cyril and Methodius University in Skopje from 1997–2002, where she graduated with honours and where she later had postgraduate studies in composition with Goce Kolarovski. Among her honours is a prize in the competition A Place on the Disc of Jeunesses Musicales of Macedonia (2000, for Six Haiku Pieces). Her music has been performed in Azerbaijan, Croatia, Denmark, Germany, Italy, Macedonia, Mexico, Russia, Serbia, Slovenia, Switzerland, and Ukraine. She is also active in other positions. She has worked as a music journalist for Macedonian Radio since 2000 and as a music producer for Macedonian Television since 2001. She has lectured on analysis and musical forms at Ss. Cyril and Methodius University since 2001.